We have made our Presidents deities. It’s wrong. And it’s costly. Let’s demand that Congress pass a law removing this cost from the sequester – like they just did for air traffic controllers. Then we need to stop funding presidential libraries with taxpayer money permanently. But wait. Private funds built these libraries. True, but taxpayers – you and me — maintain them. 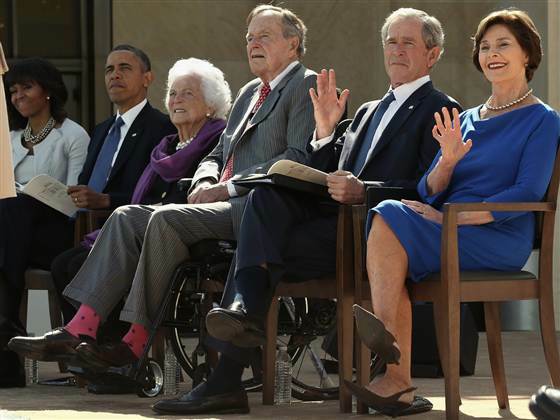 Here’s an article from Salon this week after the dedication at the Bush Library. If these institutions were maintained the same way they’re built – privately – there wouldn’t be a problem. 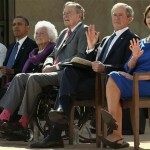 But the National Archives has accepted responsibility to run the Bush Library and Museum, as they do the other twelve. The total cost to the taxpayers for all thirteen presidential libraries is approaching a hundred million dollars a year – and growing. That’s $1 billion over ten years. Sure, that’s a drop in the bucket for the deficit. But it’s a start. And why isn’t that money added to paying down the debt or part of investment in badly needed infrastructure? Not only that, but, as Salon points out, not many people attend these libraries. They’re monuments to leaders who got into power based on funding by special interests: Wall Street, the military industrial complex; oil and energy monopolies; and the media oligopoly. So, let’s allow the special interests – mostly corporations and crony capitalists — to fund the maintenance of these monuments. This is also part of the entertainment bias in the media. Instead of examining candidates’ records, we get fluff pieces on his or her personality or the slanted viewpoint of the opposing political party. As I watched portions (watching the whole thing was boring) I recalled why he got elected. People thought he would be more interesting at a barbecue than Al Gore. It was also annoying to watch the festivities. It felt like a kinder – and more boring — comedy roast where we are the audience paying tickets to the event. But it also felt like a club that we the people are not a part of – but we are paying for.